Transaction Structure – $50.0MM advancing term loan. 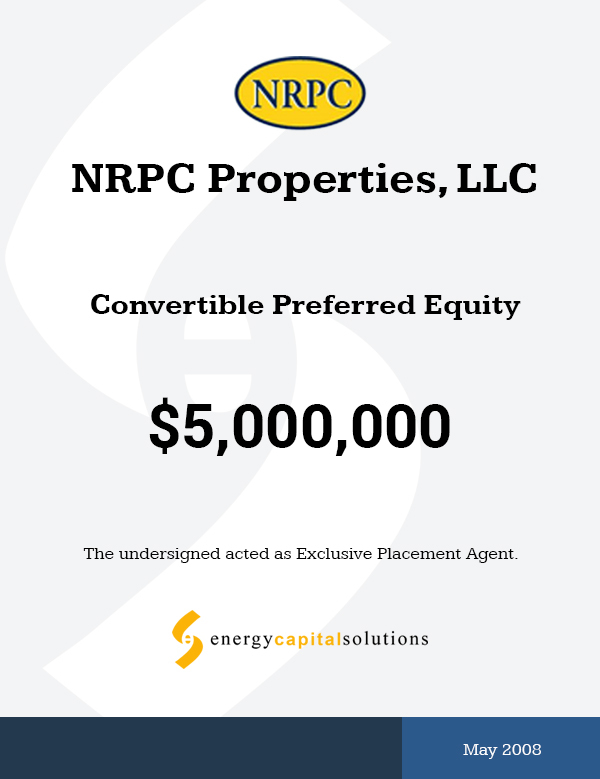 $5.0MM convertible preferred equity with affiliate company; and $0.5MM management contribution. September 2007 – ECS was engaged by Natural Resources Production Company LLC (“NRPC” or the “Company”) to raise capital to acquire and develop oil and gas assets in the Permian Basin. February 2008 – Mezzanine debt transaction closed. March 2008 – Preferred equity transaction closed. Strong Financial Sponsorship – GasRock Capital provided financing for the acquisition and subsequent development of the properties, as well as additional leasehold acquisitions. Tortoise Oil and Gas provided financing for an affiliated company to pursue additional acquisitions with similar characteristics. By leveraging the equity commitment, management will be able to acquire and develop additional and larger projects. Advantageous Structure – The Company obtained low cost of capital mezzanine debt to acquire and develop the assets and equity capital to enable the Company to pursue similar acquisitions. Majority Ownership with Minimal Management Contribution – ECS was able to secure mezzanine capital for the acquisition and development of properties and secure preferred equity capital for an affiliate company. With a minimal contribution, management maintained majority ownership of NRPC and its affiliate.